As we left Bogota behind and headed to Mexico City, I was excited. Yes, it meant the final month of this year-long adventure, but it also meant I got to see friends from home! I’ve been meditating with a group of ladies for almost five years and we have an annual ocean retreat. 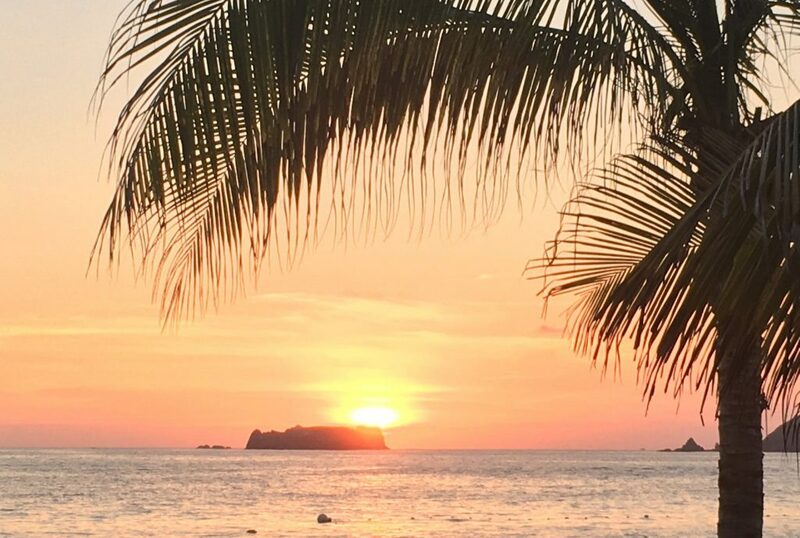 This year we chose Ixtapa – a quick 45-minute flight from Mexico City – which meant I was off to see my friends at the beach! I only had time to unpack my suitcase, repack it and head back to the airport. I left the 12 degree chill of CDMX and landed at Zihuantanejo airport and 28 degree heat – yippee! As I walked into the resort I heard my name and turned to see my friend Edleen approaching. We hugged and laughed and my heart felt calm to be connected with a dear friend again. I settled into our ocean-view room and quickly changed into my flip-flops and bathing suit and headed down to the pool. We ran into the other girls and started the reunion. There were several ladies I knew and some I hadn’t met yet. As the introductions began, I knew it was going to be a good week. After 11 months of traveling and figuring out currencies and finding grocery stores and remembering where I lived, it was wonderful to unplug and not worry about a thing. Our relaxing week included daily meditations, book study, breakfasts and dinners together, afternoon naps, and beach walks. It also included poolside silliness, sassy photo shoots, temporary tattoos and dancing on stage. There were midnight swims and all-night conversations, laughter and tears, reflection and dreaming. Exactly what I needed. One of the highlights was a tour to the turtle conservatory! We arrived at a beautiful beach location and were warmly welcomed with a drink as they explained their operation. The eggs are placed in a nest, buried in the sand, and identified with a sign that shows the dates they’re ready. It looked like a giant garden, with sticks identifying each section. In groups of three, we were shown into the nest area, given a bucket and instructions to scoop up four turtles each. They were adorable! So tiny and sleepy and vulnerable. I brushed the sand back as I uncovered each one and gently coaxed them into my gloved hand. Once we each had four, we set the bucket aside and went to dinner while the baby turtles woke up. As the sun began to set, we gathered our buckets – now with very active little turtles – and headed down the beach. They had drawn lines in the sand to indicate a “no walking” zone so we didn’t step on any turtles. Squatting down and saying some last words of encouragement to my babies, we leaned our buckets over on the count of three and released the turtles. Oh, what a sight as 140 baby turtles took over the beach! Like all babies, they had individual personalities. Some turtles took off with great speed towards the water, others slowly made their way along, others took off sideways and some even tried to climb back into the bucket! We cheered as they reached the water, we laughed as some got turned around and then found their way. And then, there was only one little turtle left and he was struggling. He just couldn’t seem to make it to the water. He took a few steps forward and stopped. A wave would come and we’d cheer, but then it left him behind. Time and again the waves came close but not quite enough. Oh, my heart went out to the little turtle. What an adventure! I walked away feeling I had just witnessed a valuable life lesson – you don’t have to be the fastest, you don’t have to be first, you just have to try. And it’s okay if you fail – dust yourself off, rest and try again tomorrow. Back at the resort, we laid under an umbrella and Edleen filled me in on all the changes in Kelowna – condos going up, buildings destroyed by fire, restaurants that opened or closed, neighborhood expansions. There were so many changes I wondered how I’ll recognize my city when I get home! I joked and said I’ll need a guided tour (which she gladly offered to provide). Sometime when we stay in one place, we don’t realize that things are changing. But when you step away for a year, you realize that change is constant – whether we see it or not. Others see it. And it made me wonder – have I changed this year? Physically I don’t think I’ve changed – my hair is a little longer but still baby-duck fluffy, I haven’t gained or lost any significant weight, I haven’t got any tattoos or piercings. Emotionally I don’t think I’ve changed – I still cry at movies, my heart melts when I see a baby, I long to love and be loved, and I practice kindness everywhere I go. But mentally I’ve changed – if I’m honest, I know it to be true. I’ve discovered a new way to live; I’ve seen proof that it’s possible to live the life you dream of; I know that people around the world are living a very different lifestyle than most North Americans. I know what it’s like to discover your passion and pursue it with all your heart. I know that living a “good” life, for me, is settling – a “great” life is not only possible, it’s 100 per cent achievable. They say once an elastic is stretched, it can never go back to it’s old form. And that’s what’s happened to me. I’ve been stretched – physically, emotionally and mentally – and it’s only natural that I’m returning home changed. But my core values remain intact. In fact, they’ve been strengthened through this experience. I know what’s important to me. I know where I’m going and why. And I know the people who will stand beside me and cheer me on – as they’ve done all year. Some people wish they could go back to when they were younger and do things differently. Those experiences, those failures, those lessons have led me to this moment – they’ve shaped the woman I’ve become, and I wouldn’t change that for the world. But I know we still have lots in common and our reunion will be sweet! Once again your writting touches me. Spending the week in Ixtapa with you was awesome. Getting reconnected after the year of changes and challenges we both endured, we have emerged stronger and more focused on what makes up happy and fulfilled. The next year holds many new and exciting experiences for us both. We can hardly wait for you to come home and hear all about your amazing year! The kids ask me each week – where is Aunty Michelle now? What cool new adventure has Aunty Michelle done this month? Have you changed yes! Has the Darmohray family changed -yes! Do we all still love and miss you -yes!! Some things won’t change! Big hugs and sunshiny smiles my beautiful friend can’t wait to see you!!! Don’t ask me why, but I burst into tears at the “left behind turtle baby” spot and sobbed through the whole rest of the blog. Poor Mackenzie was playing beside me and jumped up to hug me. What’s the matter Gramma, she asked with such deep three year old concern. Oh… Aunty Michelle is coming home, I cried. Well… that’s good Gramma…that’s really good, she consoled me …And with a pat on my back and a smile on her face she got down off my knee and went back to playing. I heard her whisper to her little toy man.. Aunty is coming home..Aunty is coming home. Counting down the days. We are so proud of you. This was a lovely piece of reflection writing. I was with that little turtle!!! so sweet and vulnerable. What a cool experience – beyond cool – to get you to a place of mental and physical change. That takes a lot to change someone. Love you lots! I’ve always been told for as long as I remember that ‘you grow with change’. You have enforced that for me once more although I don’t always enjoy change, and certainly less as I grow older. Michelle you have spent a year that most people will never experience. Joy and I have enjoyed being with you ever step of the way. You are a very talented writer that through your writings has made us feel that we were there for the ride. You girl, can be successful at whatever you do and have already proven that to many that know you. Oh, Vic and Joy! Thank you so much for your kind words and encouragement throughout this year – you have no idea how much it’s meant to me (especially on the tough days). I’m looking forward to returning to Kelowna and would love to connect for tea (or port!) – before you leave on your annual adventure! Well Michelle you are on countdown I’m sure. Coming home to the frozen tundra will be another experience for you I suspect. Joy and I would love to share a beverage with you (tea or port) sounds great so when you are back and settled in to a normal Kelowna routine, contact us and we can hopefully arrange to meet. You have my email address. Until then and in between time, continue to enjoy the remainder of your journey and be safe.